On July 24, 2014, the Chief Executive Officer of the Russian Investment Agency Yury Voicehovsky took part in a working meeting of the Minister of the Regional Development Igor Slyunyayev with the Governor of Jilin Province Bayin Chaolu, during which they discussed the implementation of joint investment projects and the development of inter-regional and cross-border cooperation of Jilin Province with the Russian regions. Jilin Province is located on the border with the Russian Federation: the length of the border with the Primorsky Krai is 232.7 km. 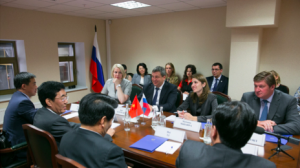 Russia and Jilin have had close industrial and economic relations for half a century. The parties have agreed on joint efforts in promoting the priority investment projects with participation of Russian and Chinese capital in the Russian regions.